Welcome stranger. Fancy your skills at air-hockey? Crash-land on one of gaming's many alien planets and you might expect to be tasked with any number of missions: rescue the planet itself from destruction, invade army bases, fight off angry hordes, and what have you. For reasons unknown, the mark of a true warrior on Shufflepuck Cantina's homeworld is to possess a supreme talent for playing air-hockey. 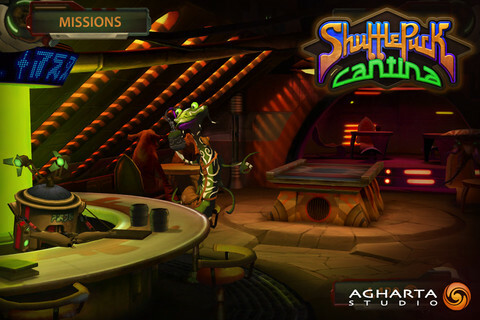 As with the game itself, you can't head too far into a review of Shufflepuck Cantina without observing the subtle and not-so-subtle parodies the game leans heavily upon. There's the music of science-fiction's most famous cantina, the blue-skinned dancers, and the bug-eyed aliens bubbling away on hookahs in the background. There's even a little bit of Borderlands' Claptrap in the robotic bartender who sets you up with your first matches. Stripped away of the impressive 3D production values, this air-hockey game is as simplistic as you'd expect. You control a mallet by moving it around the play area with your finger, working the angles and momentum of the puck so as to send it flying passed your opponent's mallet and smash the holo-glass at the far end of the table to score a point. Moving the mallet around your own half of the screen does obscure the action just a little too much, and it will take you some time to master returning particularly fast shots. The controls are competent for the most part though, and any shortcomings of control simply means you'll have to work that little bit harder to master the many opponents included in the game. Each one, from M4RVIN and his criss-cross special shots, to Harobed and her curvacious shots, adds a bit of spice to the otherwise very simple gameplay. While all of the action plays out on a central, unvarying shufflepuck table, you can choose from three different modes to assault your chosen opponent with. 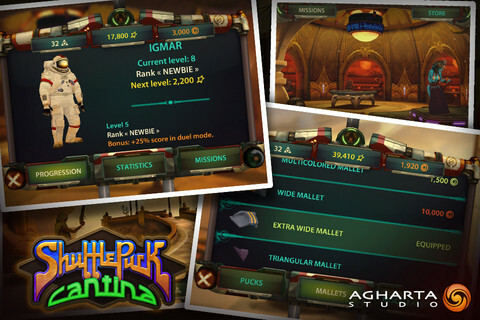 Duel is the standard version and is a first-to-five-points race which rewards success with a little loose change. If you're feeling on top of your game, you can enter the Bet mode where you raise the stakes for a bigger pay-off, as long as you can win by three clear points that is. 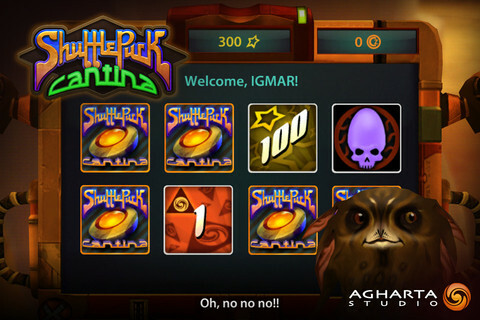 Lastly there's Survival where individual points reward less cash but stack until you lose a point. Win enough of these games and complete missions, and you'll earn money to spend on unlocking new floors containing new characters, as well as character biographies: little tidbits of good humor and information which bring you up to speed on each opponent's background and playstyle. Unlock all of the biographies and you can even assume their physical form, and enjoy playing with their unique and deadly special attacks. That's going to take quite some time though, so what about a helping hand before you get to that point? Well, over in the shop you can pick up a variety of pucks and different mallets which confer special advantages, such as speeding up or slowing down play for example. Developer Arghata should be applauded for taking such a basic gaming concept, adding some refreshing twists, and then wrapping it all up in one of the most impressive presentations we've ever seen on touchscreens. If we had one concern, it's that you'll need to earn a lot of currency to make even the most meager progress in the game. 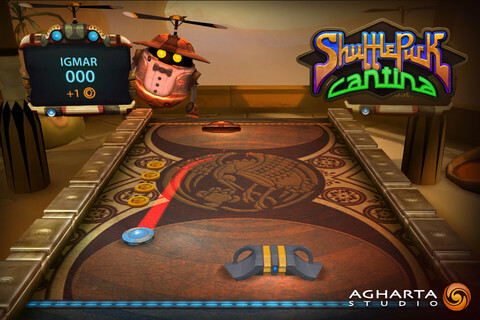 Still if you're looking for a beautifully presented air-hockey game with bags of longevity, then the competition's going to have to go a long way to topple Shufflepuck Cantina from its throne. What's Hot: Classic air-hockey gaming with some refreshing twists, set in a beautiful 3D environment. What's Not: There's a fair bit of grind to get at the good stuff. The controls can easily obscure critical moments of gameplay.